The local government in Primorsky Krai in the Russian Far East is to keep the tax burden on local casino resorts unchanged, says the director general of the Primorsky Krai Development Corp (PDC), Igor Trofimov (pictured). “What the operators need in this initial phase is stability,” noted the official in an interview with GGRAsia, referring to investors’ business planning. The PDC is a government-owned company under the Department of Tourism of the Primorsky provincial government. It is in charge of developing the Primorye Integrated Entertainment Zone (IEZ), a casino development area located 50 kilometres (31 miles) from Russia’s Pacific port city of Vladivostok. In Russia, taxes on gaming are regulated by the federal and local governments respectively. Under that system, the federal government suggests a range for such taxes, but it is up to the local government to set the actual level within that range. “Recently, the federal government increased that range, but the local government decided not to change the taxes as it understands the importance of this project [the Primorye IEZ] and does not want to jeopardise the success of this development for a short gain in revenue,” explained Mr Trofimov. The Primorsky provincial government charges RUB125,000 (US$1,902) per month for each gaming table, and RUB7,500 per month for each slot machine. “The local government, for now, has no plans to change the tax [burden],” stated the official. Tigre de Cristal, developed by Hong Kong-listed Summit Ascent Holdings Ltd, is currently the only casino resort in operation in the Primorye IEZ. The first stage of the scheme opened in 2015 and the company is now working on the property’s expansion. All of the venues planned for the first phase of the Primorye IEZ should be in operation by 2025, with the companies expected to invest an aggregate amount of at least US$2.70 billion, according to information provided by the PDC. The PDC director said he believed that a body to oversee the casino industry would eventually be created, but that “for now it was better for the casino industry to be self-regulated”. Mr Trofimov said the PDC aimed to promote a balance between the gaming and non-gaming offering at the Primorye IEZ. 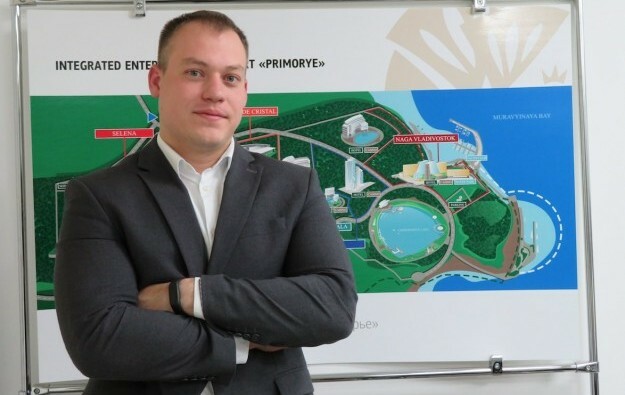 “The total area for the Primorye IEZ is quite big and we’ve decided to make it more accessible to all types of tourist – families, young people, casino patrons,” he told GGRAsia. Private companies have committed to invest in a series of non-gaming elements, including water parks, theme parks, ski slopes and entertainment arenas. “A new investor from South Korea plans to promote K-pop concerts,” the official added. “The basis of our concept is something that continues to grow overtime, and there might be some changes as we develop further,” explained Mr Trofimov. “We are now garnering the interest from the operators and working in partnership with them. Once all the land plots are leased … we will introduce some specific details for the integrated development of the entire [IEZ] area,” he added. Mr Trofimov said the PDC was “confident” feeder markets that neighbour Primorsky “will be enough to sustain the several [casino] projects at the Primorye IEZ”. That was despite new casino schemes being developed in South Korea and the recent legalisation of casino gaming in Japan. Asian countries were the PDC’s main target as source markets for customers, namely China, South Korea and Japan. “In the future we plan to attract people from further away – especially from countries that are covered by the simplified visa system – to come to Primorsky,” said Mr Trofimov, referring to some immigration rules for inbound visitors to Primorsky. The official said the Primorsky provincial government had been striving “to increase the attractiveness of the region for tourists”.